It has been a while since I posted but I am back. I had a great summer visiting family and am refreshed. Recently, I was looking at old posts. Back in April 2013, I posted about an activity called Trial and Error Pass. I have always felt this activity had a lot of value. I was surprised to find the post is now 4 years old. Some of you may not even remember seeing it the first time. Sometimes when an activity is packaged a little differently It allows for multiple presentations without students disengaging because they have seen it before. I decided to rework it with a Halloween theme. Halloween is often a time when students are allowed a group celebration. Students may think it is time off from work but little do they know. It is an opportunity to build social skills. 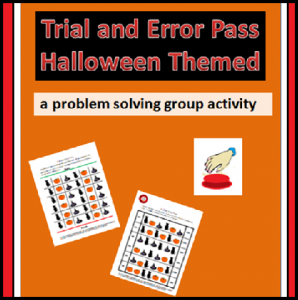 Trial and Error Pass is a good activity to use with small groups or a class. For those who are working on social skills, it provides an opportunity for students to generalize skills into a classroom setting. 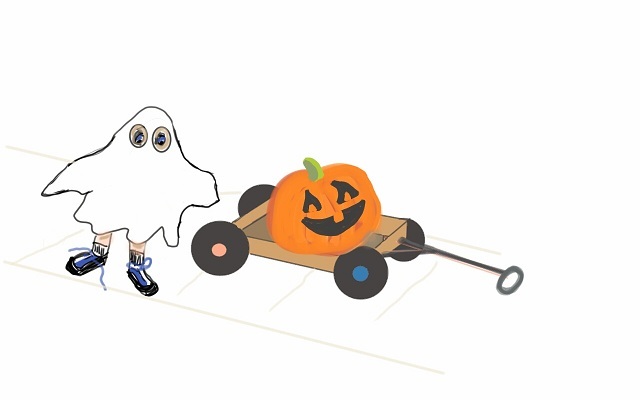 You can make this activity easily enough on your own with clip art. If you want to save some time and effort you can down load it from my TPT store for a minimal cost. Just click on the button for a direct link. The activity requires students to use a trial and error method of problem solving. It reinforces the idea that mistakes are not necessarily bad and can be used for learning. It also teaches students to work together toward a common goal. The solution is found by observing the mistakes of everyone and it would be very difficult to succeed individually. It also requires students to use their short term memory and make inferences to predict the pattern. 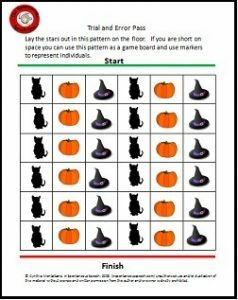 This activity can be used with small groups of students, two competing teams, or with one or two students. The object of the game is to cross a grid in 6 moves stepping on the correct sequence of objects. They determine the path by trial and error. Cards are laid out on a carpet in a grid pattern. If you do not have room to lay them out you can print off a grid to make a game board and use a game marker to represent the person crossing the grid. I think using large motor movements makes it more interesting for some students. A judge, who could be a student or teacher, is selected. The judge takes one of the pattern cards that will be the solution to the stepping pattern. A student begins the challenge by stepping on one of the objects in the first row and moves one row ahead for each step. As the move is made the judge indicates if it is the correct one by saying right or wrong move. There are buzzer sounds available on apps for electronic devices that make it even more engaging for some students. The student continues to move forward as long as he steps on the right object. If it is the wrong step the person returns to the start or the end of the line and watches the attempts of others until they get to the front of the line again. The students may notice that a pattern is developing as students discover the correct moves. This will speed up the progress until someone finally makes it across. The students should be reinforced for working as a team and not make it an individual competition to make it to the finish. If you prefer not to have a Halloween them to the activity there is the generic version. Just click on the button and it will take you there. This fall I am enjoying my retirement status and doing things I didn’t have time for the last few years. It was nice not to have the stress that comes with the beginning of the year. I have been thinking about all of you SLPs in the trenches. This year I find I need to rethink the way I do my social pragmatic group. This year several things have made it difficult to form the group. The last 4 years I was able to form the group with five to eight students across two grade levels who had language processing issues or autism and had social issues as a result. Most of the group could follow instructions with a bit of modeling. This year the scheduling of the core academics has kept me from taking students across more than one grade level and I don’t have a core group. I have two students who attend general education and are severely impacted socially. They really need roles models but i don’t have other students with language processing issues to make a large group. These two will be going to middle school after this year so staff are really concerned. Our Autism specialist brought up a program that she thought might work called “Circle of Friends“. It has been used on the West coast and in a few schools in the Portland area. Basically a club is formed from a peer group. The peer group is mentored and gets instruction from the speech therapist, counselor, or other special education staff. The group members then plan activities for the group that everyone can participate in and be included. This group then becomes a way that special needs children can get social experiences from a peer group that is socially supportive. It can even move with the children as they progress through the grades. This is conference week at my school so we are beginning the first phase. Our plan is to set up a lunch bunch of five to six students that will meet once a week. We will get permission from parents this week so that students can participate. This bunch will receive some training and do some bonding. We will then introduce one of the students and see where we go from there. Our school is the site for the Life skills Program and we have more children with special needs as a result. The children remain fairly separated even though they are in the same building. Because most of our extra programs such as music, physical education, and library have been lost to budget cuts, there are few opportunities for them to be included. It is getting harder for them to have opportunities to participate with their peer group. As with anything these days, it is difficult to find time but hopefully this program will have a general effect on our whole school atmosphere. I’m hoping to record our progress with this program. If anyone has used this program or something similar, I would love to hear from you. Did it go well?